The sixth of January, many catholic countries celebrate the Day of Kings, or the three Wise Men. This day is also known as the Epiphany, and in the Christian tradition celebrates the arrival of the three wise men to Bethlehem. In Spain, this holiday is arguably as important as Christmas as it is a national holiday. However, in France while it is celebrated it is not a holiday. What do people eat on this day? In many countries it is Kings Cake. However, countries like Spain and France have their own versions of the pastry. What are the differences? In Spain and other Latin American countries the tradition of Kings Day, is when children receive gifts. 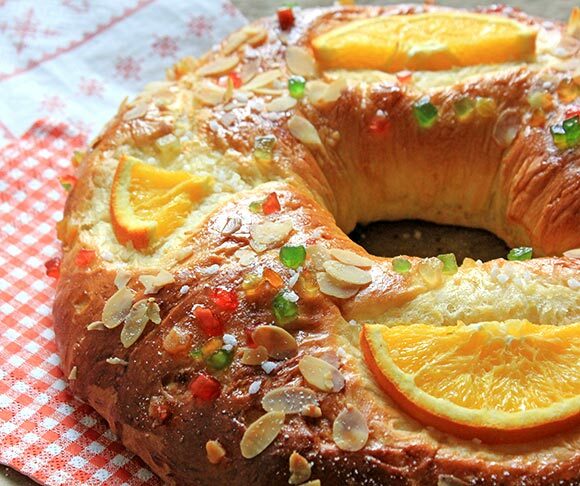 To commemorate this day, people eat Roscón de Reyes. While the cake was traditionally round with an empty center (like a crown), it can also be found in an oval shape. There is so much demand that in many bakeries, one must order their cake days in advance. It is made out of dough and sometimes has a filling of cream or chocolate. It is topped with candied fruit, and even has a trinket inside. Whoever finds this trinket has to pay for next rosc ón. In France, the same holiday is celebrated. However, their pastry is slightly different from the Spanish version. The Galette de Rois is a round puff cake filled with frangipane, a cream made from sweet almonds, butter, eggs and sugar. The French version also has a trinket inside the cake to be found. This is called the fève. Bakeries sell the cake with a paper crown, and whoever finds the trinket must wear it as well as pay for the next cake. Just like the Spanish version. Which cake will you be indulging in this year?